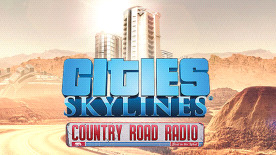 Saddle up with a new radio station: Country Road Radio, playing 16 original new songs in four sub-genres: Appalachian Folk, Bluegrass / Honky Tonk, Nashville Modern Country, and Unplugged Country. The radio host is pure Dixieland Delight, spinning six instrumental songs and 10 with original vocals. This content requires the base game Cities: Skylines in order to play.